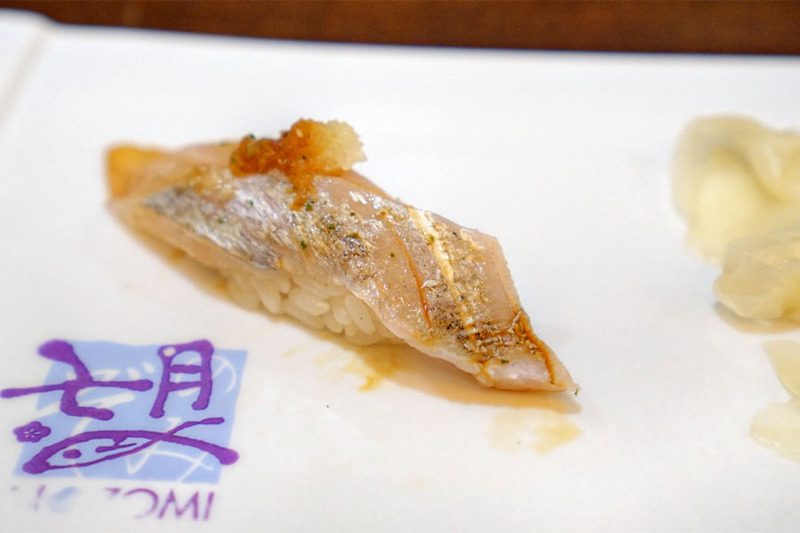 Since I first posted about Nozomi back in 2009, the spot has sort of become a sushi staple in the South Bay, known for its high-quality, reasonably-priced omakase. Given that it'd been nearly seven years, I figured that it was about time to file another report on the place. One of my dining companions frequents the restaurant often, and I managed to tag along on a recent outing. Inside, things haven't changed much since I did my last write-up. The organizer and another fellow diner arranged for corkage to be waived and thus provided our beverages this evening: five bottles of bubbly and one dessert wine. 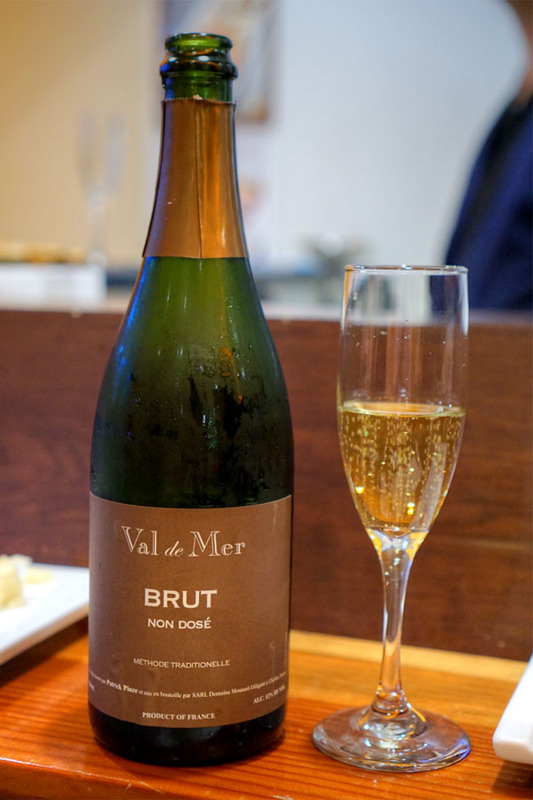 First was the NV Patrick Piuze Val de Mer Non Dosé Brut. Nose brought lots of toastiness and fruit, with a distinct Burgundian character throughout. On the palate I got more Chablis elements mixed with biscuit-y notes, some minerality, and more sweet apple. We commenced with what our Chef described as porgy, or large eye sea bream. 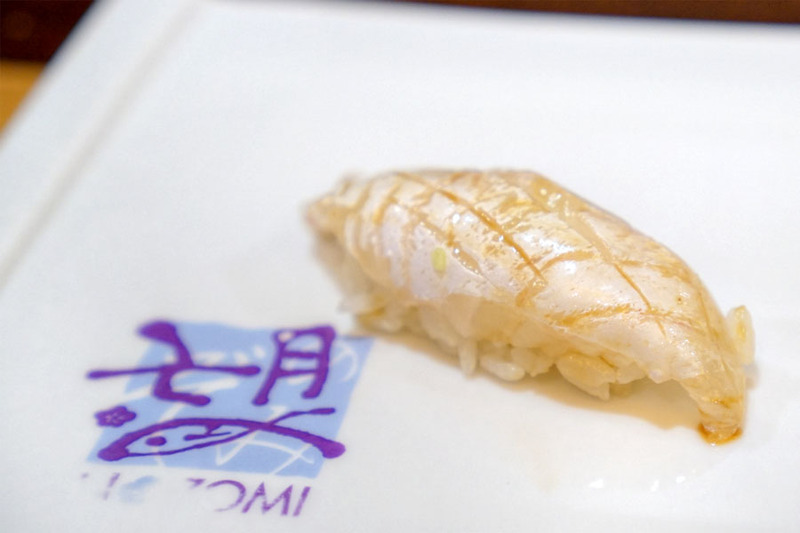 Whatever you want to call it, the fish made for a strong start, a clean, slightly sticky cut with a tartness to it and some lovely umami notes. 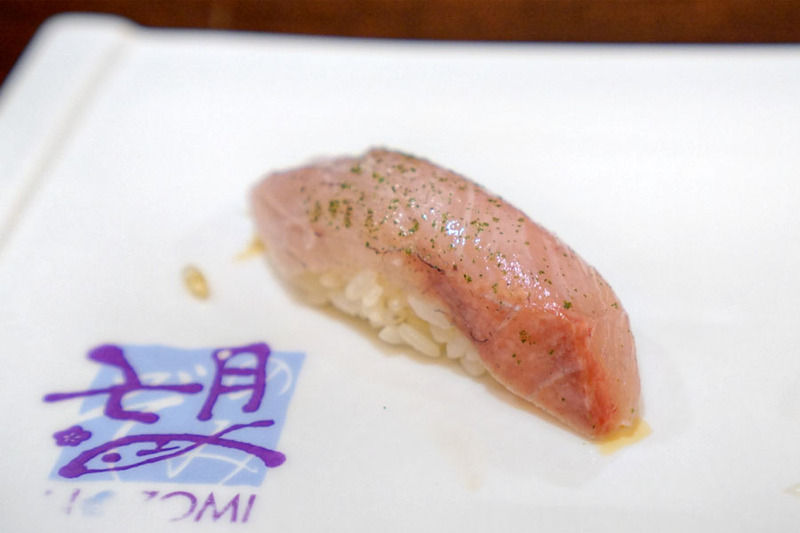 Baby amberjack came out super clean and finessed, with some great lemon-y nuances and zestiness from the shiso. 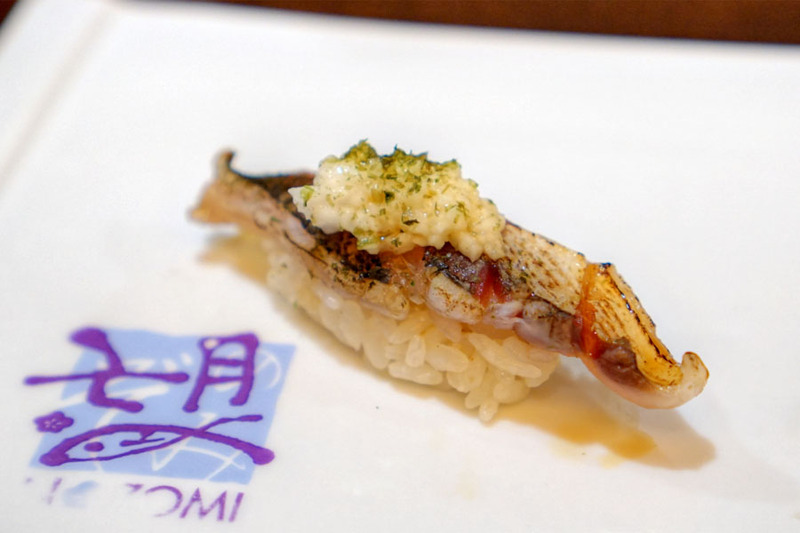 Prepared using the kobujime method, barracuda arrived lightly seared and topped with yamaimo. The contrast between the char and the gooey, bland character of the mountain yam was pretty genius, and I was a fan of the chewiness of the fish too. 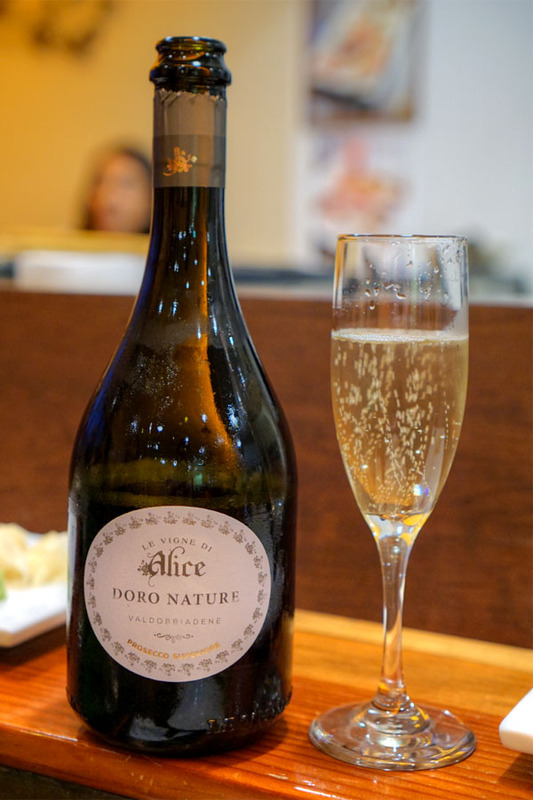 Next to drink was the 2015 Le Vigne di Alice Prosecco di Valdobbiadene Doro Nature, which was quite different than our first bottle. I got massive, delectable aromas of lemon and sugary fruit. The taste brought more sweet fruit at first, but the wine finished on the drier, crisp side. Fun and quaffable. As usual, geoduck was pleasantly chewy, somehow managing to be both crunchy and yielding at the same time. 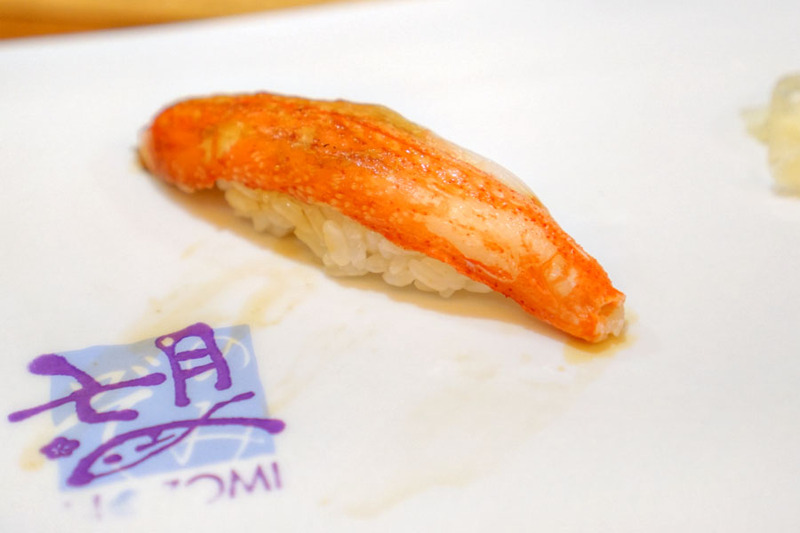 I also found it super briny, but with the strip of nori imparting a moderating umami note. 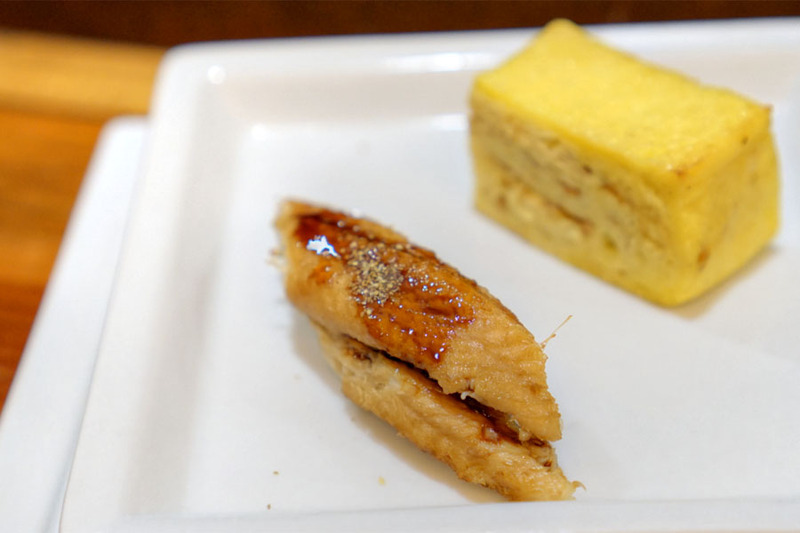 Cutlassfish (or beltfish) came topped with grated daikon and yuzu zest, both of which worked beautifully alongside the neta. Nice bite on this one too. 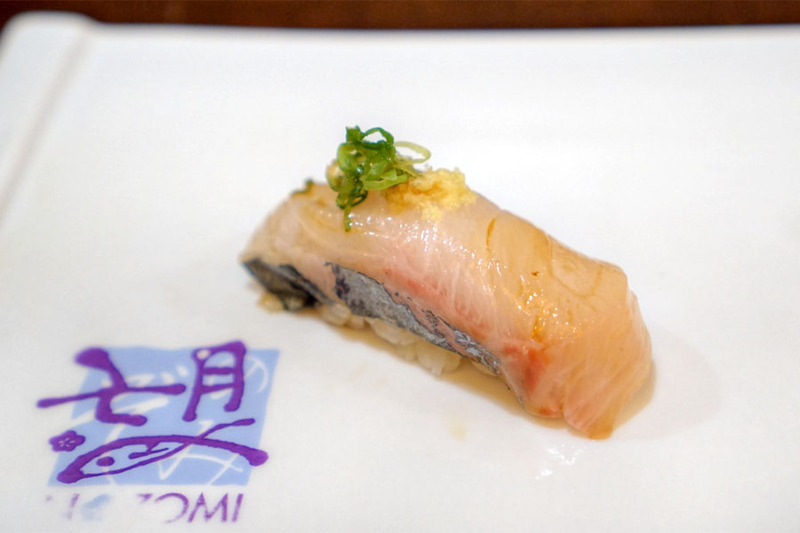 Wild white trevally mackerel (a.k.a. striped jack) was a winner. Think super silky, slippery almost, with a refined brine that matched perfectly with the ginger/scallion combo. 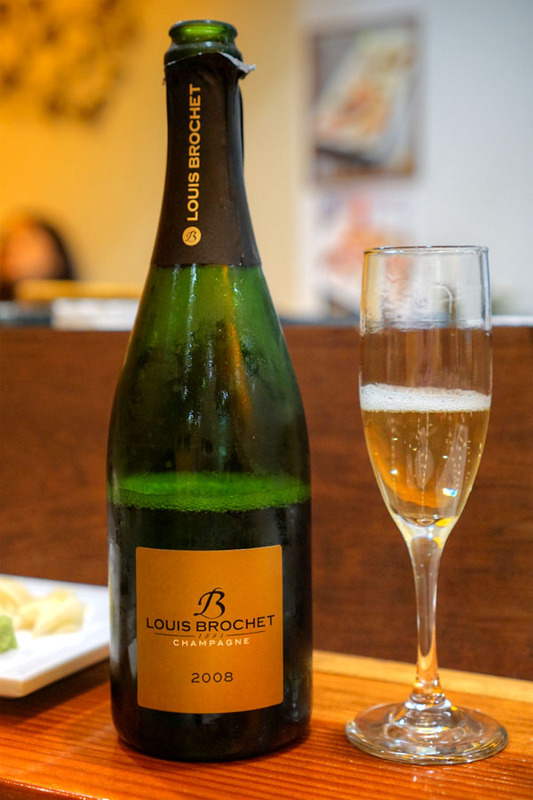 The 2008 Louis Brochet Champagne 1er Cru Brut Millésimé was our first proper Champagne of the bunch. Bouquet on this one was all about savory, brioche-like notes, with light citrus. In terms of taste, I got more toastiness and a honeyed sweetness that, when combined, actually reminded me of KFC biscuits, humorously enough. 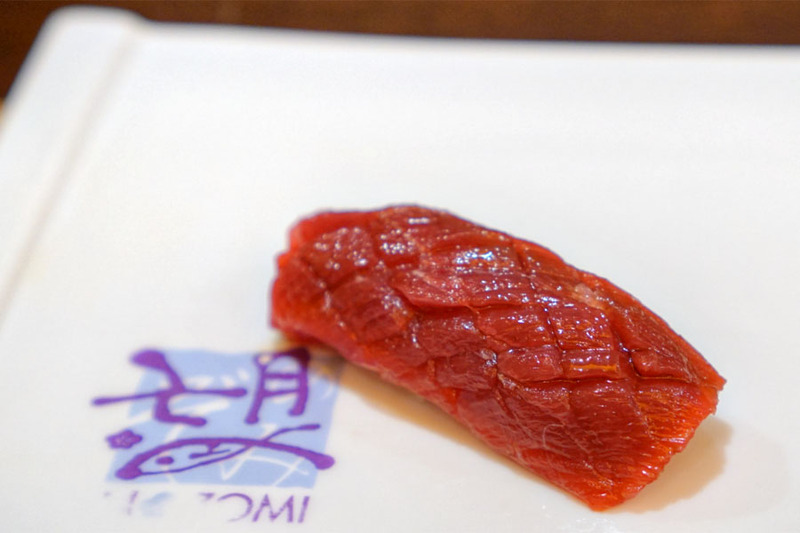 A ruby-hued sheet of Spanish bluefin was wonderfully supple, with a deeply satisfying, soy-enhanced flavor profile. 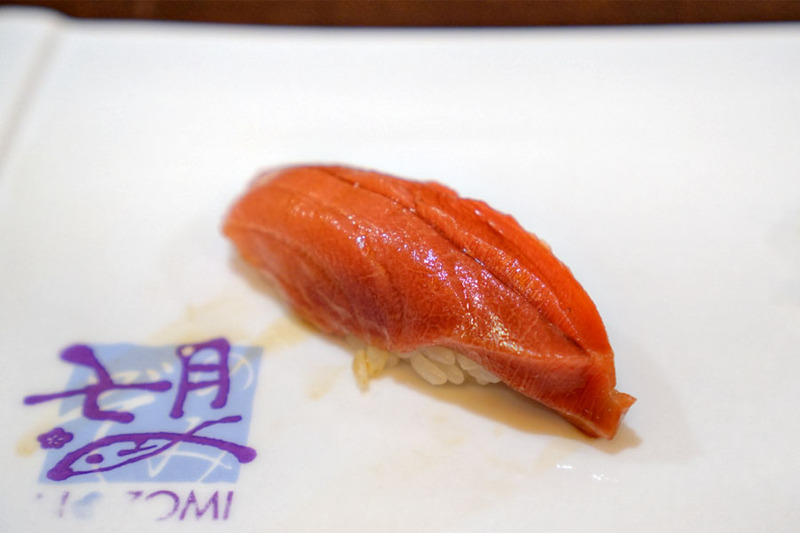 Medium toro was even softer, with a fattiness that pervaded the cut. The wasabi certainly played a bigger role here as a counterpoint to the richness of the fish. Snow crab was a crowd pleaser, the leg coming out sweet and saline, yet enhanced by a brush of soy. 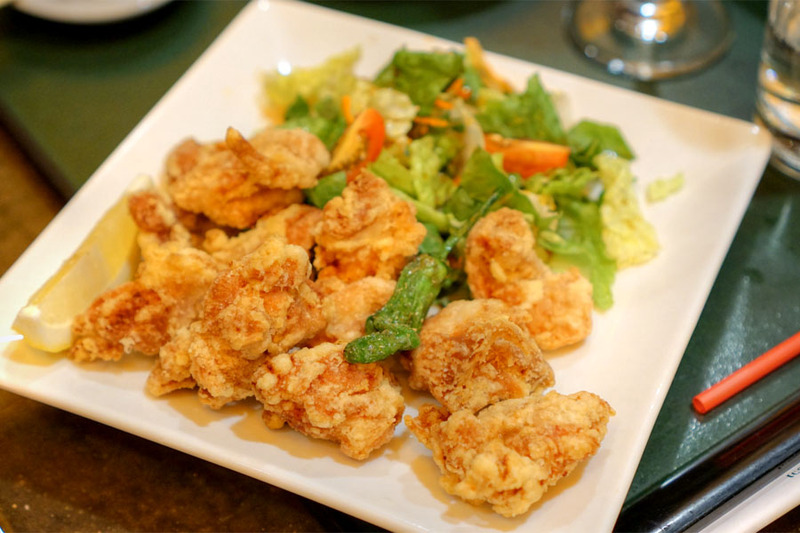 One of my dining companions ordered some kara-age, which was absolutely spot on with its marinade and crispness. 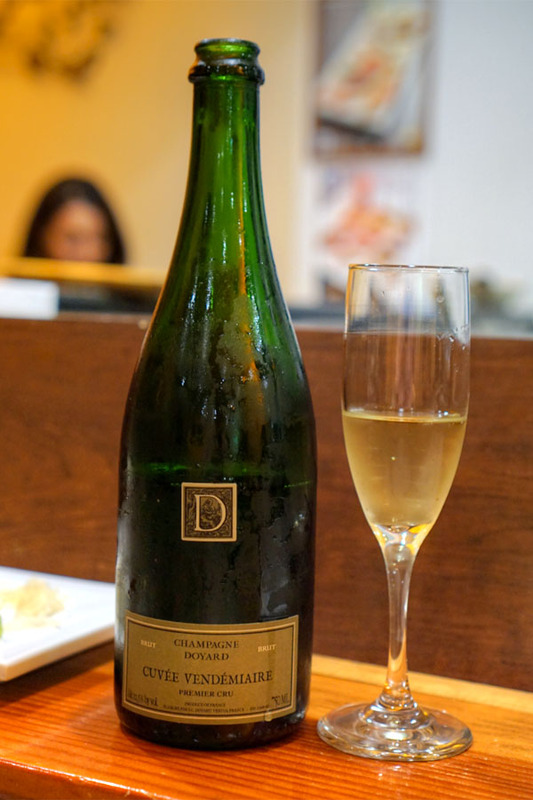 The NV Doyard Champagne Cuvée Vendémiaire Brut showcased aromas of tart apple and light, yeasty funk. The taste was drier, mineral-forward and toasty, but with some vibrant fruit still peeking through. 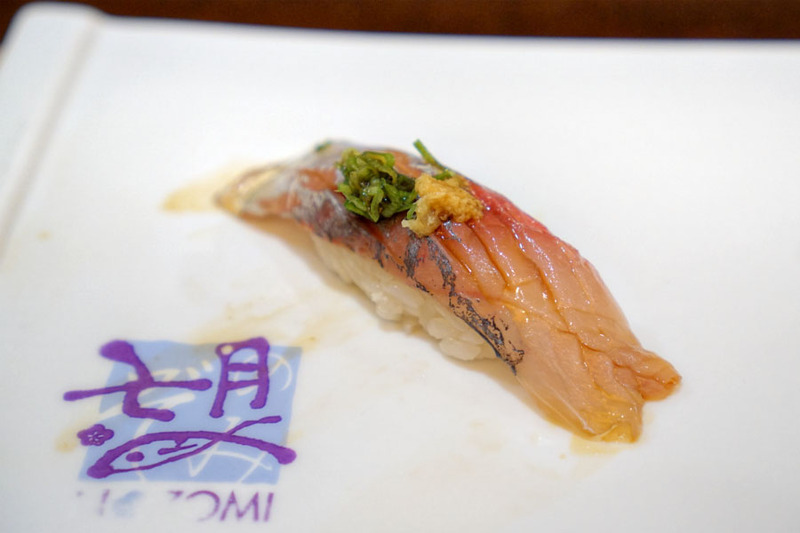 Wild Spanish (horse) mackerel was slick and supple on the palate, its restrained fishiness well-complemented by a topping of ginger and green onion. 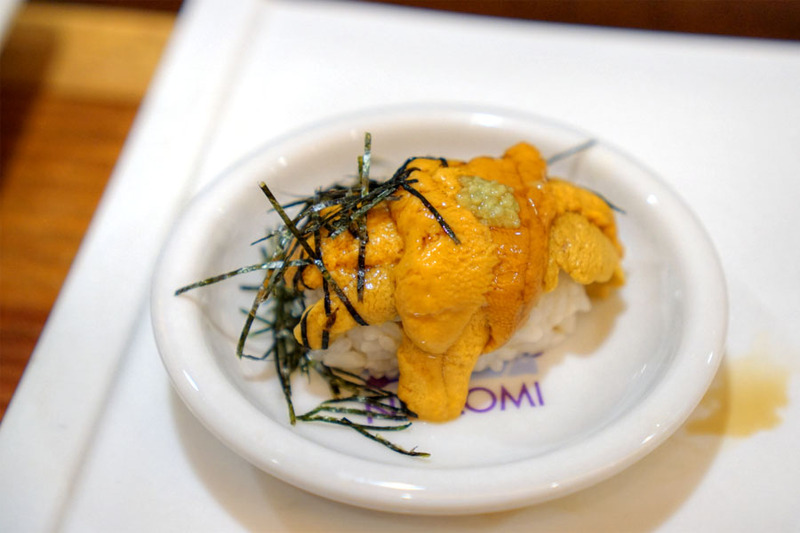 Santa Barbara sea urchin displayed its signature creamy-sweet brine while nori and wasabi worked flawlessly as complements. 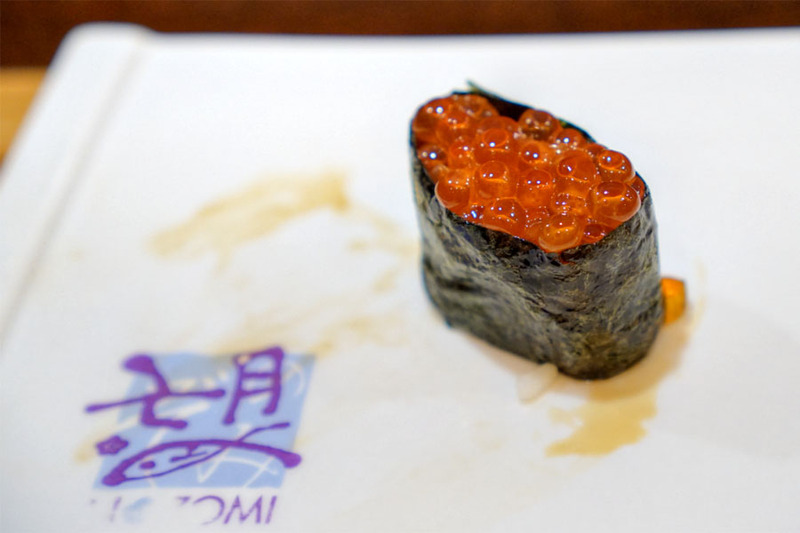 Pops of salt and brine from the salmon roe were just what you'd want, nicely evened out here by the loose-packed rice and seaweed. 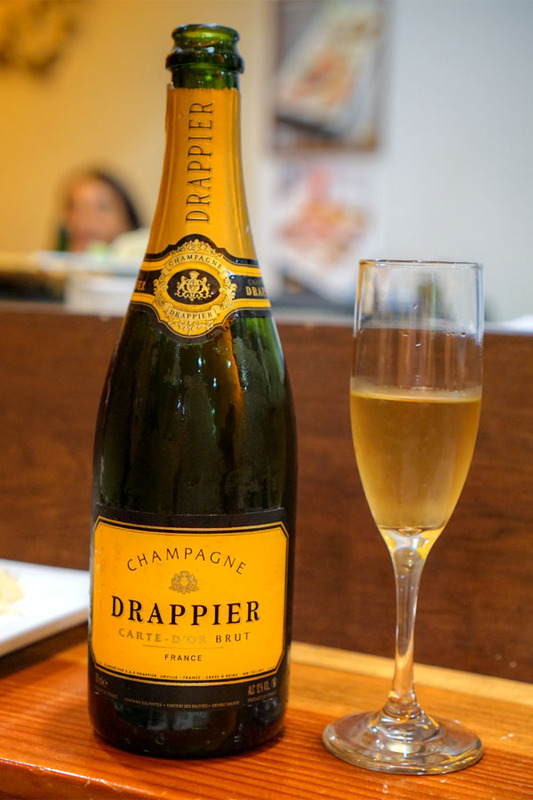 The last of our dry wines was the NV Drappier Champagne Carte d'Or Brut. I got a weaker nose on this one, with muted notes of apple, mineral, and yeast. The palate was more assertive though, bringing plenty of tartness and acidity, along with some grassy and savory elements and a bit of heat on the finish. 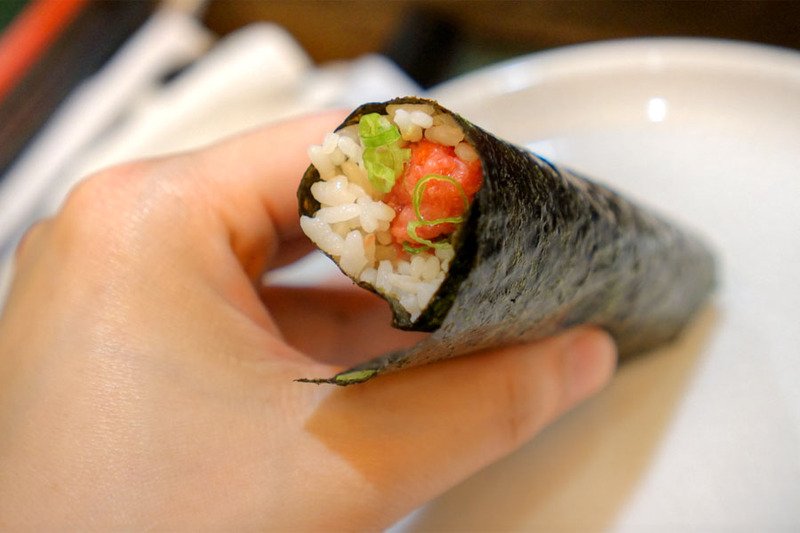 Our sole hand roll played fatty tuna against scallion in classic fashion, the rice working as an effective base. 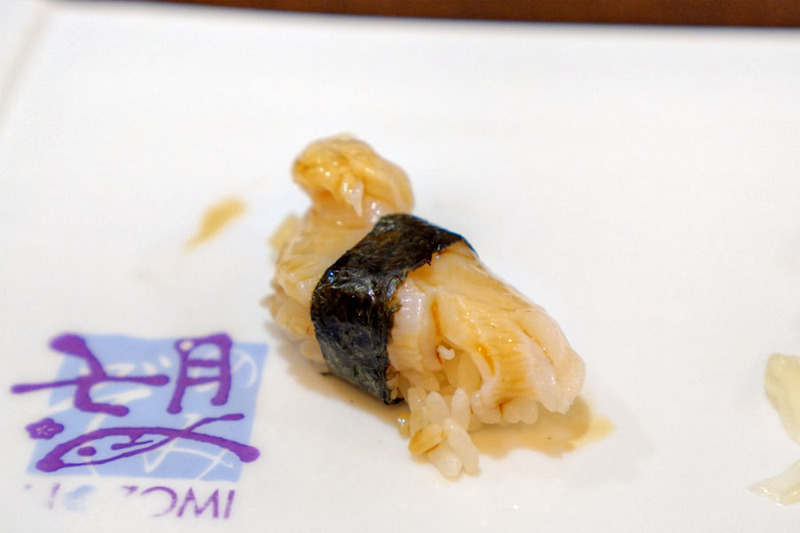 Sea eel was pretty prototypical--soft to the bite, with a pleasant balance of sweet 'n' savory flavors and a hint of spice from the sansho. We ended, not surprisingly, with a slab of omelette, a sweet, eggy, particularly fluffy preparation that served well as a closer. 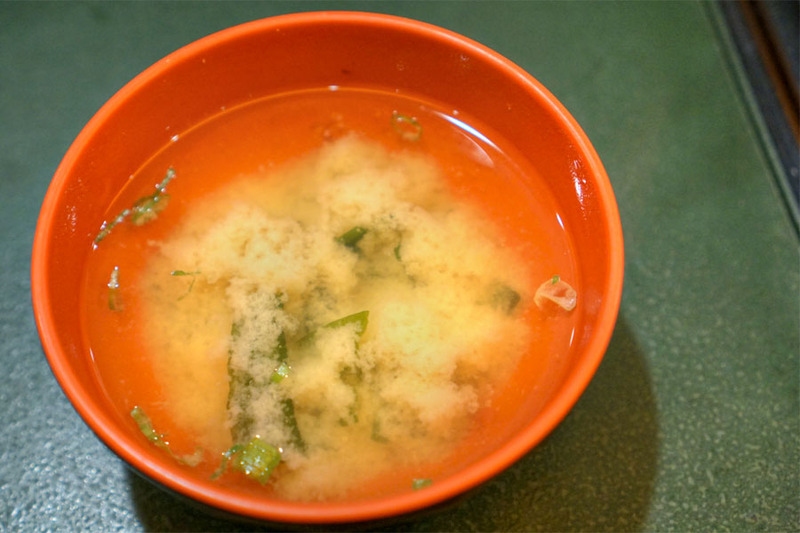 A cozy, classic miso soup to finish. 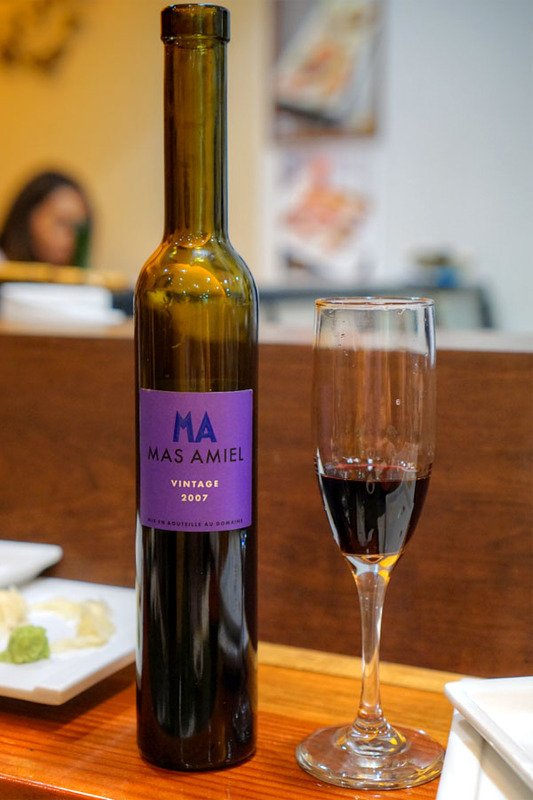 Dessert wine duties were supposed to be handled by the 2007 Mas Amiel Maury, but unfortunately the bottle was likely corked. It smelled very, very musty, though the taste wasn't as off-putting due to the wine's considerable sweetness. 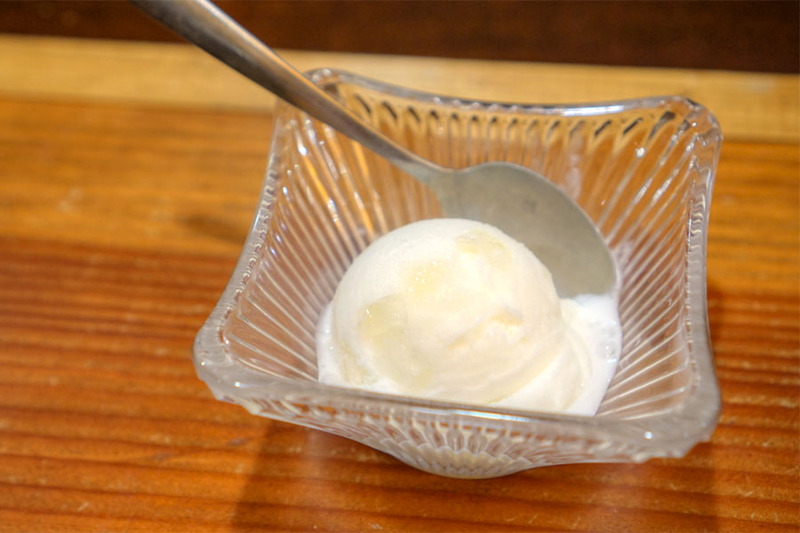 With the savories all done, we ordered a few desserts, and this lychee-infused sherbet definitely showed off the sweet-tropical nature of the fruit. 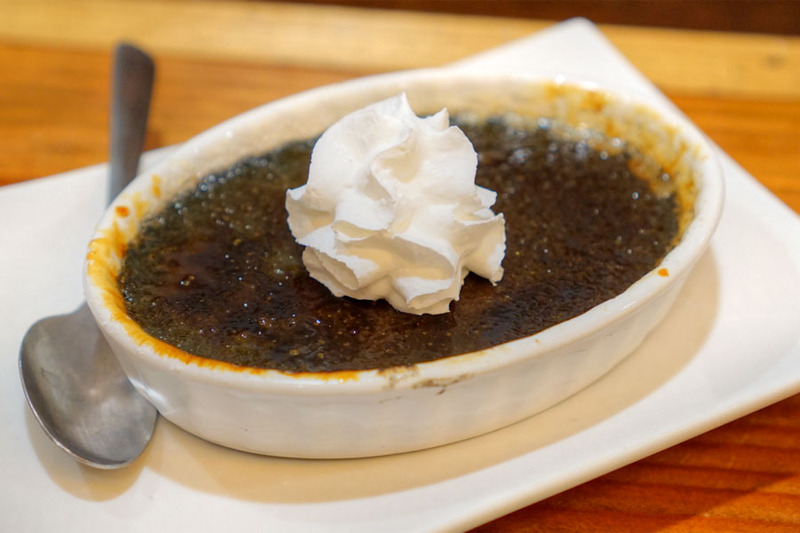 The crème brûlée had that delightfully crisp, caramelized crust that you want, as well as plenty of rich, nutty-sweet black sesame flavors. 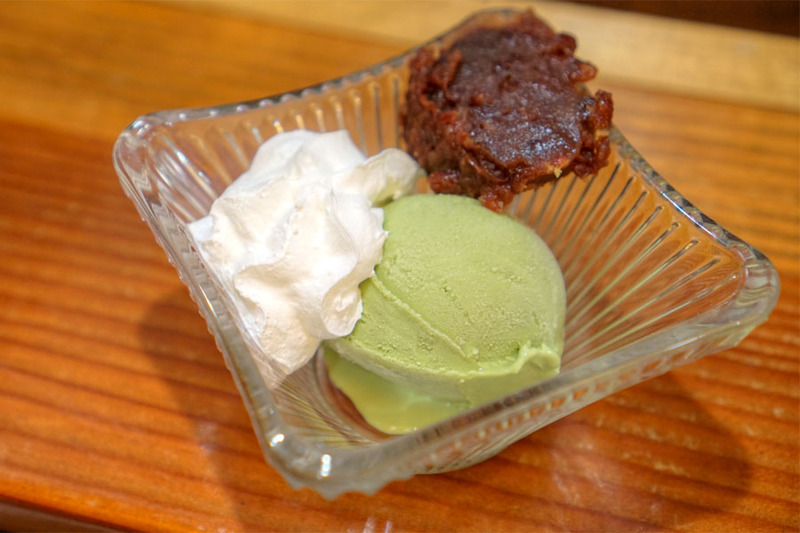 The ubiquitous matcha ice cream had its bitterness matched by sugary adzuki bean. Another successful meal. Nozomi's long been my top sushi recommendation for the South Bay, and this dinner just reinforced that point of view. Definitely worth a shot if you've not already been. Afterwards, we headed up to the Commerce Casino to meet a friend visiting from out of town, and ended up cracking open a few beers in the process. 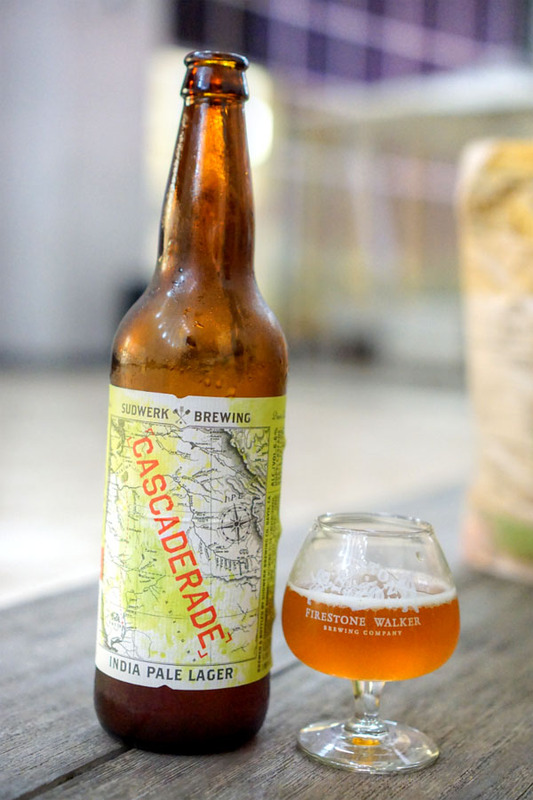 We kicked things off with the 2016 Sudwerk Cascaderade, an imperial pale lager dry-hopped with Cascade. Smelled of sweet melon commingled with hops, and tasted of piney bitterness backed by an undercurrent of sweetness. Not bad. 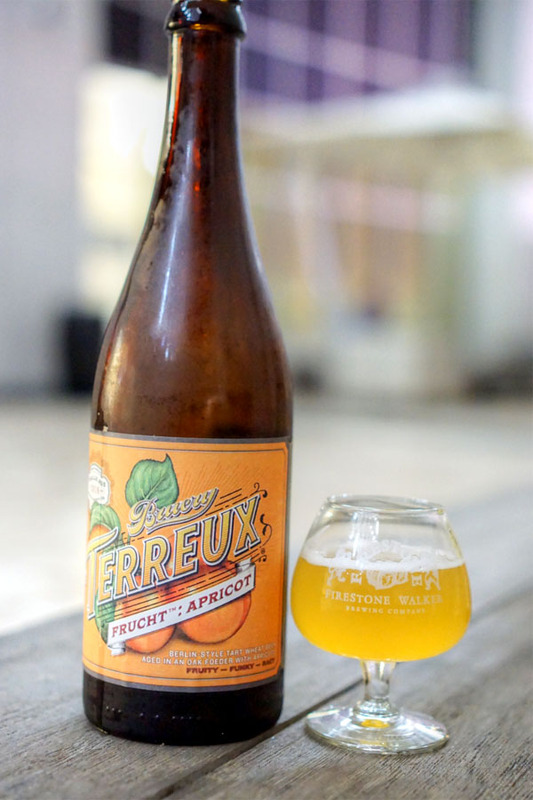 Next was an oak-aged Berliner Weisse, the 2016 Bruery Terreux Frucht: Apricot. This one had rich, jammy aromas of stone fruit and sweet spice, while the taste showcased tart, acidic apricot skin throughout. Better than expected. 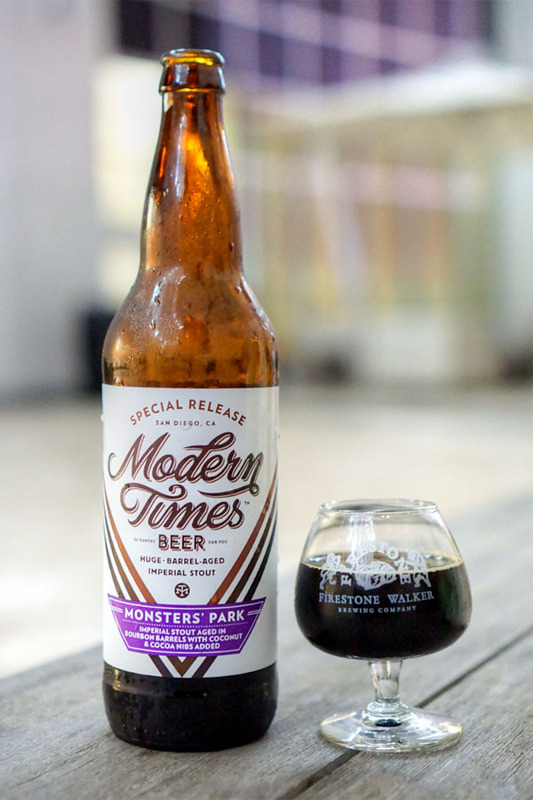 Moving to something heavier, we opened a stout, the 2016 Modern Times Bourbon Barrel Aged Monsters Park with Coconut and Cacao Nibs. I found the beer quite smoky on the nose, with additional notes of dark fruit but not much coconut. On the palate, I got more of that dark fruit and smoke, tartness, malt, and roast, but again less coconut than I wanted. Not as good as last year's I'll say. 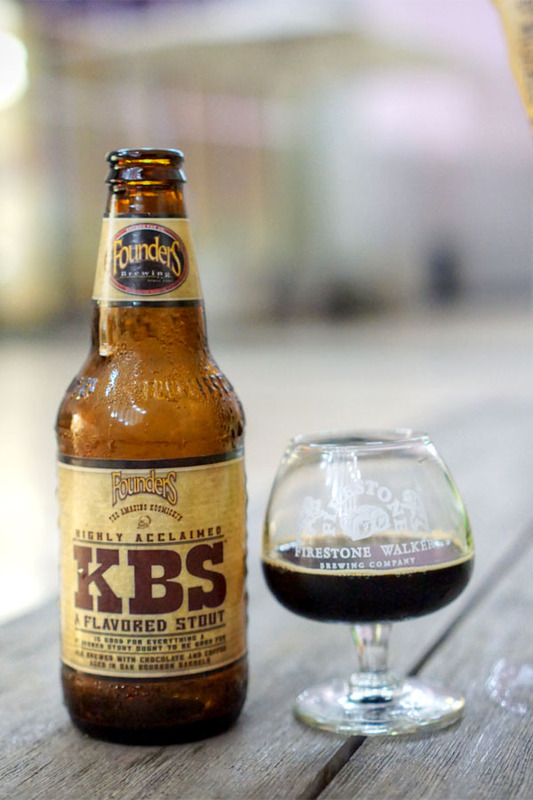 The 2016 Founders Kentucky Breakfast Stout (KBS) was along the same lines as the Monsters' Park, an imperial stout brewed with coffee and chocolate, then aged a year in bourbon barrels. The bouquet on this one was definitely heavy on the chocolate and cocoa powder, with some berry fruit tagging along. Taste-wise, I found plenty of bitter, roasty flavors and more smoke. 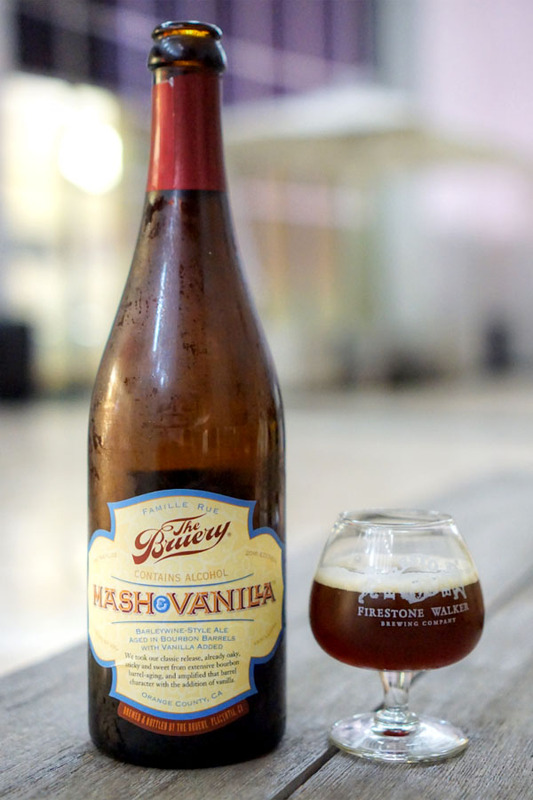 The 2016 The Bruery Mash & Vanilla was a bourbon barrel-aged barleywine with vanilla added. Aromas of sugary malt and vanilla all over the place. Taste showed off a fruity character mixed with sweet malt and oak, the vanilla becoming more apparent toward the close. 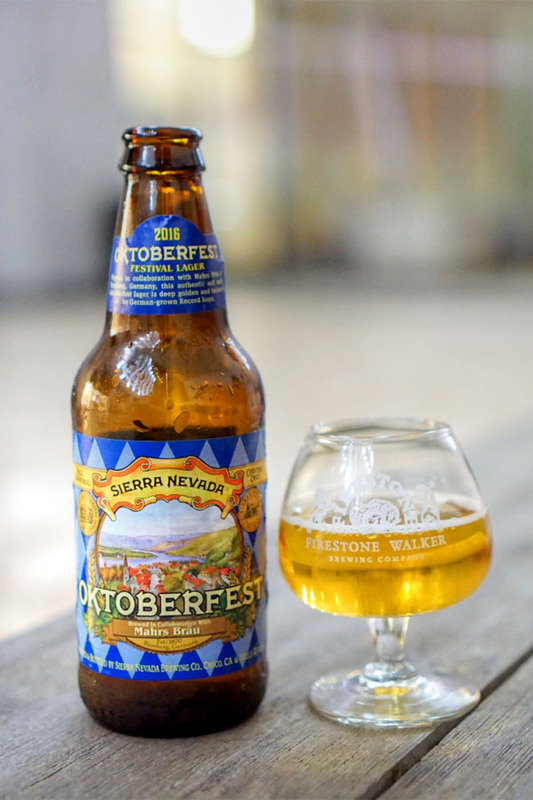 Last was a Märzen hopped with Record, the 2016 Sierra Nevada Oktoberfest, brewed in collaboration with Germany's Mahrs Bräu. Nose here was decidedly sweet, grainy; palate had more of the same, along with plenty of malt, light hops, and a very soft, silky mouth feel. In all seriousness, Nozomi is notorious for discriminating against non-Asian clientele. I have experienced it myself, and it has been confirmed by many others. I can assure youmy wife and I are not trying to order spider rolls with spicy mayo. We would order exactly what was eaten in this review. Nozomi hates white and black people. They don't hate Mexicans because their own dishwashers are Mexicans. Yes, I experienced the same thing. Flat out racist restaurant. Really disgusting people running this place. It's a shame, because I work and live nearby. 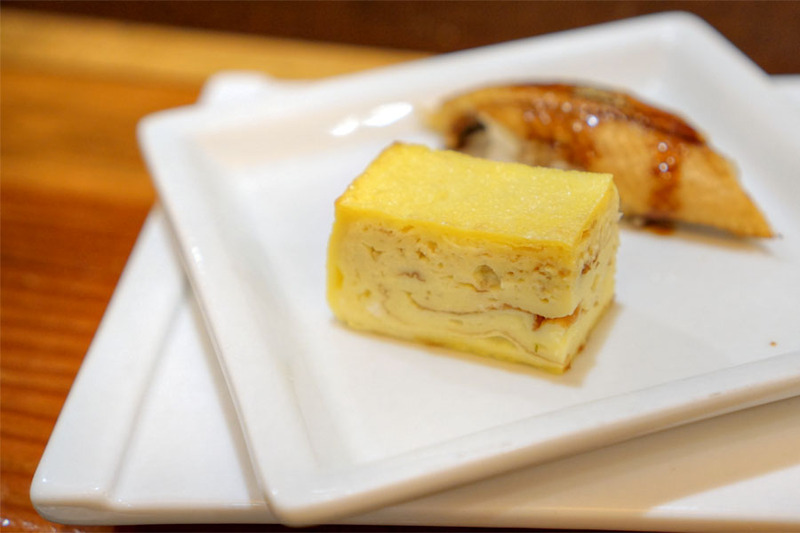 I happen to go to Nozomi regularly with white, Hispanic, and Black friends and the staff has always been great to them, regardless of their race. My friends enjoy the place so much that they now go without me and have never had a complaint. Also, about 25% of the regulars at the Sushi bar on any given day are non-Asian, specifically white, Russian, and Hispanic. You can tell that post was by the Nozomi owner. Damage control. Another vote for VERY racist establishment. Glad to hear others speaking up. Stay away--unless you are Asian. Wow. Presumptive aren't we. I'm not the owner. I'm a regular customer. So, anonymous people complaining about racism there, why don't you use your real names instead of hiding behind your "anonymous" posts. By the way, I was just there on Friday, 6 of the 14 customers at the Sushi bar were non-Asian. All six non-Asians are regular customers that I've seen before. There was a party of 5, regular customers that are Russian. They're there at least once a week, if not twice a week. How much did Nozumi cost? Do you still believe it's a good value? Also, can you comment a bit more on the anago? I had the eel at mori at it was one of the tastiest things i've ever eaten in my life.